The Labour leader said Mr Flynn, who died aged 84, was fiercely independent and never "besotted by power". Newport West AM Jayne Bryant said he was a "giant of the Labour movement" and "a tenacious campaigner". 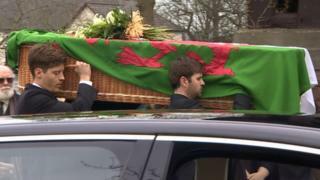 Wales' First Minister Mark Drakeford and Welsh Secretary Alun Cairns were also among those in attendance at St Woolos Cathedral in Newport. Speeches recalled the variety of campaigns Mr Flynn applied himself to - his opposition to war, his support for devolution and his love of the Welsh language, among others. Mr Corbyn said the late backbencher "could be devastatingly powerful in an often quiet way". "Paul's contribution to our lives and Parliament was something very special," he added. Newport West AM Jayne Bryant said Paul Flynn was a "giant of the Labour movement" and "a tenacious campaigner". "Best of all, he was kind, inspiring and so much fun to be around," she said. Ms Bryant described how Mr Flynn had "brought politics alive" to her when she was aged nine. "His background shaped him," she said, describing his roots in the Grangetown area of Cardiff of the 1930s, where "poverty was near universal". The AM said Mr Flynn "never forgot the painful, proud and honest poverty of working class life". He was "respected across the political divide, with his wonderful turn of phrase, witty comments and incisive mind", she said, adding that Mr Flynn was "far ahead of his time on issues which others found too controversial". She said the sacrifice and commitment to democracy shown by the Chartists - Newport's 19th Century campaigners for electoral reform - were a "constant inspiration" to the late MP. Former Cardiff Central MP Jon Owen Jones said Mr Flynn "had a keen intellect" which he applied "to the thorniest problems of our times". "It wasn't just his brain but also his heart - he had the courage to speak out," he said. "He was no one's poodle, but a dragon, with a tongue of fire." Paul Flynn was a Welsh patriot "with a love of the Welsh language", and a House of Commons man "par excellence", Mr Jones added. "When he spoke there was a fair chance he would say something original," he said.